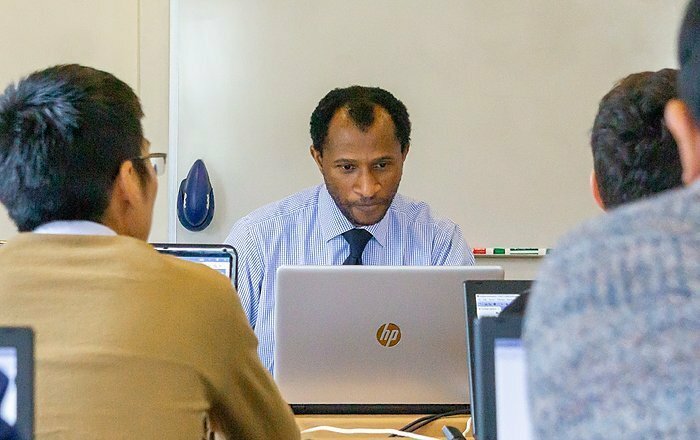 Obinna Kalu is a dynamic, enthusiastic young Assistant Computer Science Professor who loves teaching and has a keen eye on the future. 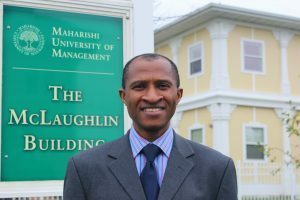 We sat down with Professor Kalu and asked him a series of questions about his background, including time spent as a student prior to joining our faculty. Q: When did you start teaching at Maharishi University of Management? A: I started teaching MSCS program distance education courses in March 2015. Then, in August 2017, I started teaching on-campus Computer Professionals Program (“ComPro”) courses right here in Fairfield. Q: Why do you enjoy teaching at MUM? A: The first attraction for me is our unique campus environment—the peace and serenity, we enjoy. I very much like the team I work with here in the CS department, and the breadth and depth of knowledge available from my co-faculty members. And then, the great students we get to work with in every class that I have taught. The overall daily experience in teaching/learning here is simply awesome! Q: What is it that attracts so many top students from around the world? A: MUM offers easily the most affordable means to boost their careers in professional software development. Our students can gain top-notch, full-paying practical internship experience in some of the best U.S. IT companies—which cannot be gotten anywhere else. 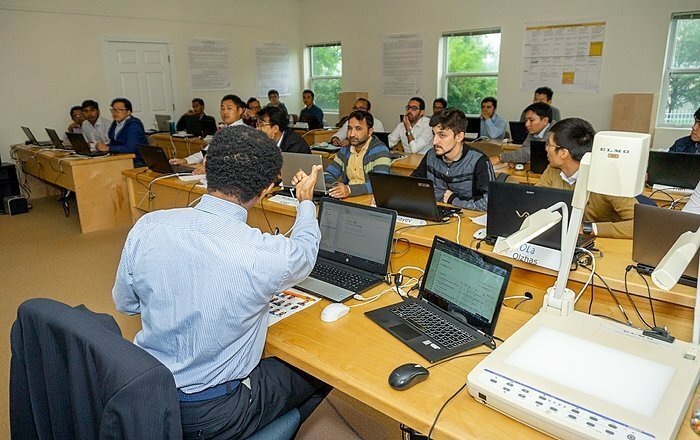 Our students are very bright, highly motivated, and are always eager to learn and try new ideas and technologies. Our CS curriculum is first-rate. Having spent the prior three years studying in a similar master’s program in England before coming here as a student in 2004, I could easily compare and see the remarkable difference between the two. Ours is a very practical, purpose-designed MS in CS program. All of our courses are designed to equip students with the latest skills and technologies that are in very high demand by the best companies in the industry. Q: What are the unique benefits and advantages of studying at MUM? A: The first unique advantage is learning the Transcendental Meditation® technique, which students, faculty and staff use to live a low-stress, balanced, happy, wholesome life. TM helps me maintain a balanced life. With my regular practice of TM, I find that no matter how hectic my teaching schedule gets, I still always feel that inner bliss, joy and happiness. Another advantage is the quality of the cutting-edge skills that they acquire in the ComPro MSCS program. Since 1996, more than 1000 U.S. companies have hired our students. Average annual internship salary is around $80,000. A: In my higher education studies, I first earned a Bachelor of Science degree in Mathematics and Statistics from the University of Lagos, in Nigeria. After graduating from college, I spent a couple of years working for a small but prominent software development company in Lagos as a trainee programmer. And then two more years following that, working for a bank in their electronic banking technology department. Then I went on to earn two Master of Science degrees—one in computing and information technology from the University of Bedfordshire in England, and the other in computer science, right here at MUM, graduating in 2008. I first learned about MUM from one colleague in the bank in Nigeria where I worked. He had learned about MUM from a friend of his who was a student here at the time (~ 1999). Q: Where did you work during your ComProSM internships and after graduation? A: I was a Project Programmer at AECOM and a Software Developer III at SAP in Arizona for my internships, and later was a Software Engineer at NORC at the University of Chicago in Washington, DC before joining the MUM faculty. A: I teach Software Engineering, Web Application Programming, Enterprise Architecture, Modern Programming Practices and Fundamental Programming Practices on the graduate level, and have also taught Data Structures on the undergraduate level. Q: What advice do you have for software developers who want great careers? A: My advice to young, aspiring developers is for them to stay hungry to pursue learning and achieve even more. There are an increasing number of new tools, techniques and technologies to get into and enjoy working with. In other words, keep learning new things, as the future in software technology is bright! Do not hesitate a minute once you come across information about our unique MSCS degree program. It offers easily the most affordable means to boost your career in professional software development, through which you can gain top-notch practical experience in some of the best IT companies here in the U.S.
Q: What do students say about your teaching? A: I plan to continue in my teaching career for the long-term. And I also hope to (in parallel) pursue my PhD in one of the areas of artificial intelligence in the near future. When not teaching, Professor Kalu enjoys cycling, trail running and hiking on our beautiful 365 acre campus.